I think Thailand ranks up their on the bliss-o-meter too. Is that map-quilt supposed to be backwards? I take exception to the title of your post. i wonder where the bliss-o-meter would put america now? the backwards quilted weirdo america was not as much of a thrill for me, but that's ok.
i agree carto—maps are never pointless. There's nothing like quilts and maps. Or hookers and Jaeger. Either way. 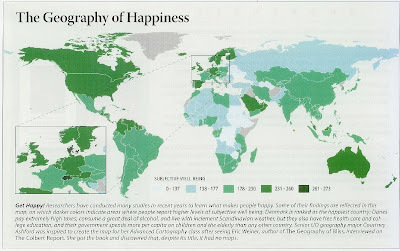 I wonder what a state breakdown of subjective happiness in the US would look like. The Geography of Happiness would be a great title for something else too. Actually many things. I am happier just thinking about the possibilities. Oh, I can see the dual appeal of the quilt easy peasy. It would be neat to have one personalized with little markers of where a person lived or where the family was situated. Actually, it does have a triple appeal if you count history. @Reb: It clearly ranks up there on YOUR bliss-o-meter. No. It is not supposed to be backwards. @d: Well, ~I'm~ still pretty blissed out. But then, I'm on the West Coast. @Dr. Ken: An excellent analogy. @Dan: According to the standards given, it would likely look like a sad South and relatively happy everyplace else. Which hits the nail on the head for me personally, but might not jibe so well with your average inhabitant of, say, Meridian, Mississippi. @Karma: True. But that was before the OSU/USC game. 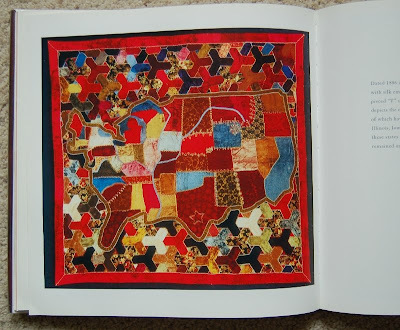 @Boo: I've seen a couple cartobiographical quilts before. I've just stuck with straight cartographic quilts, myself.